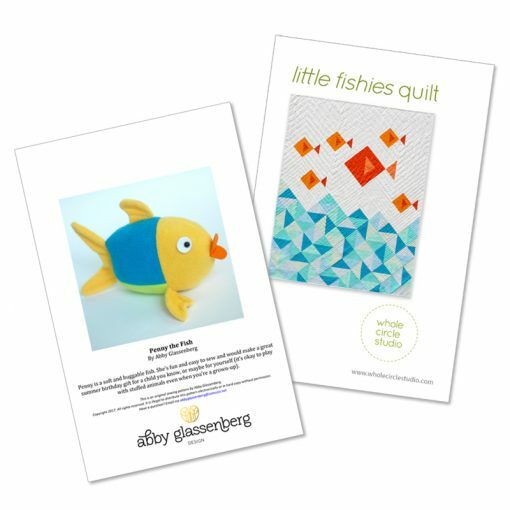 Quilts are wonderful gifts for babies and kids, but when you can bundle it with a soft, cute and cuddly toy, they’re even better! I’ve been an admirer of Abby Glassenberg of While She Naps and her work for a while. 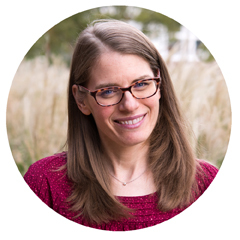 If you’re not familiar with Abby, check out her website for more information about her. One of Abby’s many talents is designing and writing patterns for softies. Abby and I connected about a month ago and realized that her Penny the Fish and my Little Fishies quilt complement each other nicely. We are now offering the two patterns as a gift set. 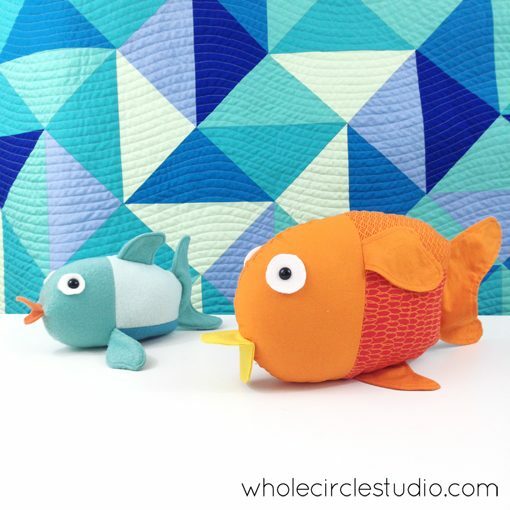 Little Fishies Quilt and Penny the Fish Softie Gift Set. 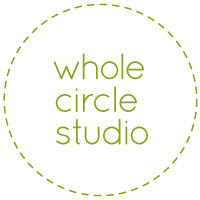 Quilt Pattern by Whole Circle Studio. 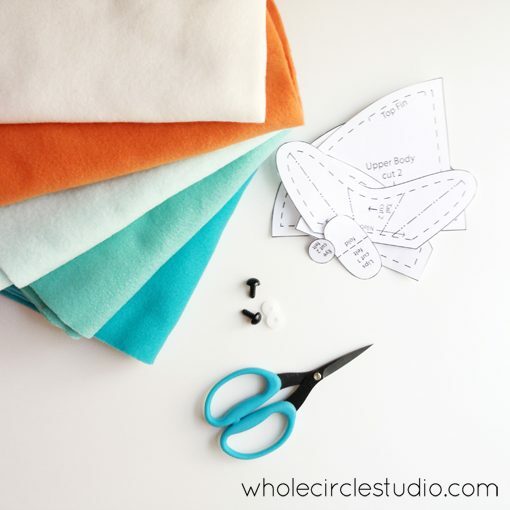 Softie Pattern by Abby Glassenberg of While She Naps. Softie made by Abby. If you’ve already purchased the Little Fishies quilt pattern or just want to make Penny, click here to get the pattern. 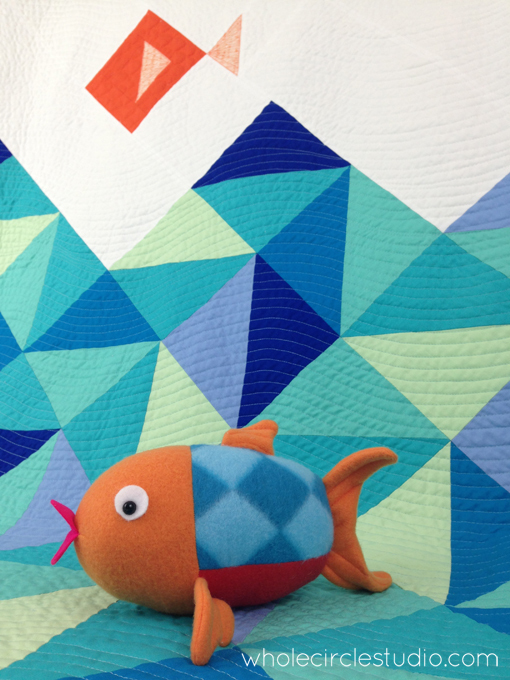 The Little Fishies quilt and Penny the Fish softie is the perfect present. 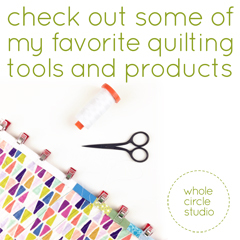 Both projects are beginner friendly and easy to make. Detailed instructions and photos/diagrams are provided, making them a breeze to piece. 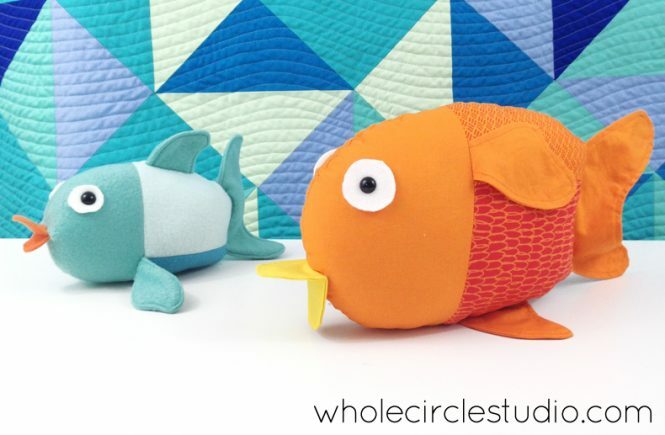 Penny the Fish can be made from fleece or use scraps from your Little Fishies quilt. So … How beginner friendly is Penny the Fish? I decided to test it out myself. While I’m really comfortable making a quilt, three dimensional sewing intimidates me. After talking with Abby, I was inspired to make my very own Penny. In fact, I made two! Once I had all my supplies organized and prepared the template, each Penny took a little over an hour to make. Materials for testing out Penny the Fish softie. Penny got me over my anxiety of three dimensional sewing! I felt so accomplished, I decided to make a second Penny. This time, I enlarged the pattern by 150% and used leftover cotton fabric from my Little Fishies quilt to construct Penny. Since I didn’t use fleece or felt for the lips, I made some minor modifications in order to use cotton fabric. While not as cuddly, the pattern does work well in cotton and is still very soft. I did make one goofup at the end—it was one of those dumb mistakes you make when you’re tired and eager to finish. Can you notice the mistake? I’ll call it out at the end of this post. Coincidentally, a few weeks ago Fairfield sent me some Poly-fil Royal Silk Fiber Fill to test out. I used it to stuff both Penny softies and found it very soft and easy to work with. The stuffing made the finished Penny consistent and smooth. 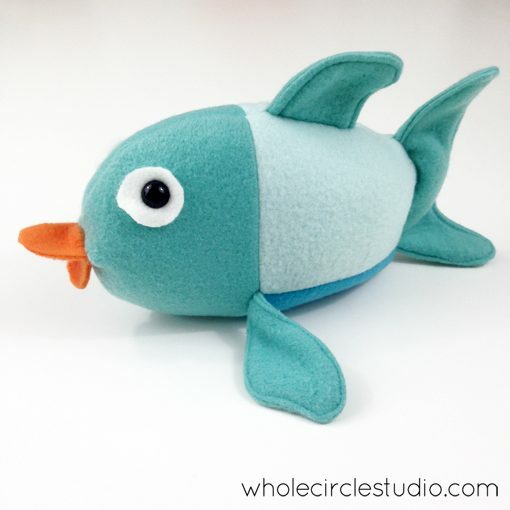 Blue Penny the Fish: made with fleece. 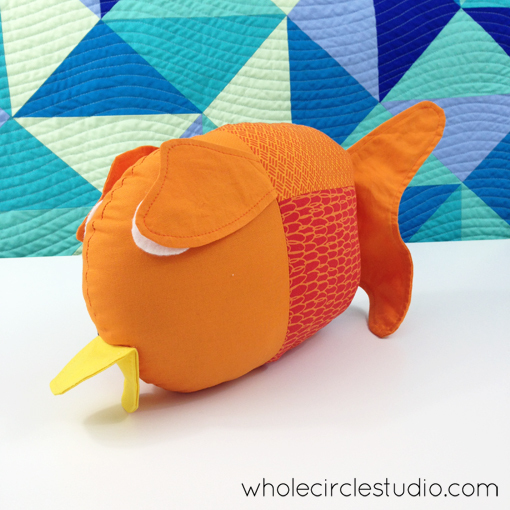 Orange Penny the Fish: enlarged to 150% and made with cotton fabric from my stash. 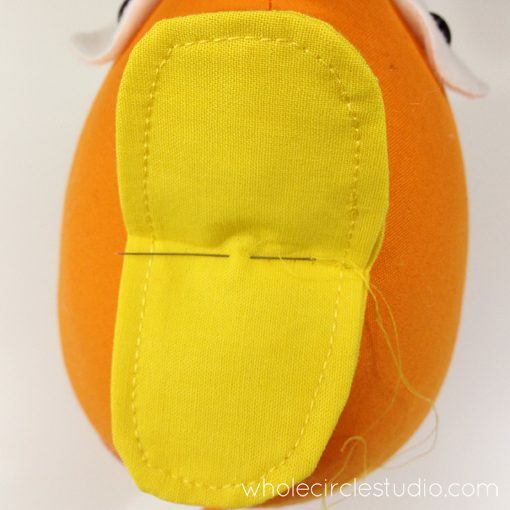 Penny the Fish #2 in progress / hand sewing on the lips on the cotton version. Okay… so here’s the scoop on my goof up! I reversed the pattern when I poked the holes for Penny’s eyes for the cotton version, so she’s upside down. Her top fin is on her bottom half and her lower fins are on her top half. I think this gives her some character (and she can now cover her eyes with her fins in slight shame!). Penny (and Sheri) slightly embarrassed about the goof up! behind the scenes: Kona Sunset yoga pant/leggings!